Dundalk manager Stephen Kenny will be coming to Brandywell intent on claiming three points. 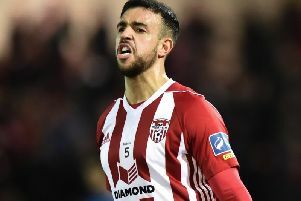 PETER HUTTON has dismissed suggestions that a mis-firing and perhaps vulnerable Dundalk will arrive on Foyleside tonight with the Derry City boss expecting a ‘formidable’ test from the league champions. Stephen Kenny’s troops come into the game on the back of a hugely disappointing scoreless draw against 10 man Longford last week and having won just one or their last six fixtures. Not the form of champions! Statistics can be misleading, however, and the Lilywhites’ league form would indicate that of a title winning side having won five and drawn two of their last seven league games. Therefore Hutton expects Kenny’s men to be ‘smarting’ from their EA Sports Cup semi-final exit and last weekend’s stalemate against Longford at Oriel Park and eager to make amends. Tonight’s match marks the start of a ‘massive’ seven days for the ‘Candy Stripes’ where they face difficult league matches against Dundalk and Sligo Rovers (Monday) before meeting Drogheda in the FAI Cup (Friday). “Without being disrespectful to Galway or Longford, Dundalk are certainly a step up in class,” said Hutton. “It’s going to be a difficult game but it’s one we’re looking forward to given the positivity in the last couple of weeks. “Statistics will say they’ve won one in six but that’s taking into account the BATE Borisov and the Galway League Cup game where they had seven or eight players missing,” he added. “So we’re well aware that they’re a formidable outfit and have a lot of quality and strength within their ranks. “They’ll be smarting from only getting the draw against Longford last week and they’ll be going all out for three points against us.